A unique running tour that combines a hilly trail run with incredible historical places, stunning views and hidden corners. From the ancient Etruscan walls of Fiesole, to the heart of Florence, across wild woods with spectacular views on the city. 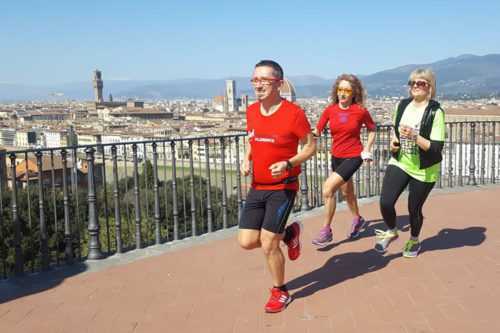 This wild trail running tour will guide you to the heart of Florence via a run through history, landscape and nature. Time to get back in time. Starting in the small and quaint center of Fiesole in the hills next to Florence runners will take in the beauty and atmosphere of this village that was founded by the Etruscan in the IV sec B.C. As we begin our run prepare yourself to enjoy a mixture of history and nature. You will run by the Roman Amphitheater and have incredible views of the “Craddle of Renaissance” as Florence is also called, before diving into the wild woods. The trail of the ancient stone quarries will lead runners down the hill where we reach small and picturesque villages surrounded by olive trees and the typical Tuscan landscape. After reaching the riverside we will make our way into the city center with the impressive scenario of Ponte Vecchio and the best known architectures of Florence greeting us. The course is hilly but mainly downhill (we’ll reach Fiesole with a short taxi ride). The course ground is mixed but mainly asphalt and land and can be run with normal running shoes. The trail in some short parts is a little bit technical but we can also walk if you are not an expert trail runner. This tour is suitable for a trained runner because of the distance and the hills. The tour duration is up to your personal pace, but just to have and idea it usually takes between two and three hours. Top and most scenic trail run up and around Fiesole – steeped in historical sights – through lovely forest on mysterious trailways, passing beautiful Villa Strozzi della Madonna delle Grazie through beautiful cypress avenues with highly competent running guide Lapo. Looooved it! Will do it again for sure …. Thank you Ursula, it was really my pleasure to run with such an expert runner!